The hot, late-afternoon sun could not deter a group of lower school English Language Institute (ELI) students from heading outdoors for recess, where they located a shady spot by the play structure and happily constructed a tower out of wooden blocks. Although the group spoke several different languages, they expertly communicated in the silent yet universally-understood language of childhood play. Few words were spoken, but concentration ran high as the group stacked block upon block. Once satisfied with their work, they took time out to talk (with interpretive help from a counselor) to Harker News Online about their experience in the school’s growing ELI program for elementary school-aged children held at the Blackford campus. In addition to swimming, her favorite things about ELI so far have been archery, circus arts and computer lab. “I like it all,” said Kozak, who has been to the United States several times but never before in the ELI program. “My favorite thing about ELI is recess … which we are in right now!” enthused 11-year-old Aaron Guo of China. The first-time ELI participant added that his second favorite activity is basketball. He also liked all the “fun outings” to places like the Golden Gate Bridge and tide pools at the ocean. Each summer the lower and upper school campuses are filled with excited students like Kozak and Guo, who come from abroad to improve their English speaking and writing abilities. And this year the lower school has a greater number of attendees than in previous years; in the lower school alone there are children from China, Korea, Japan, Ukraine and Turkey. According to Anthony Wood, ELI director, the program saw a notable increase in enrollment at the beginner level, with more foreign students over at the Blackford campus than ever before, requiring a total of four classes. Older students (middle- and high school-aged) attend ELI on the Saratoga campus. In addition to The Harker School’s rich global educational programming offered throughout the school year, summer at Harker brings with it its own special international flavor, as students meet and interact with peers from all over the world. ELI initially began as a year-round boarding school, which closed in 2001. Its current summer program evolved and has been around since 2004. There are more than 60 students enrolled for the secondary division over the course of this summer, and at least 55 enrolled in the primary division. Many ELI students and their families learn about the institute via the recommendation of American friends or relatives familiar with the program. 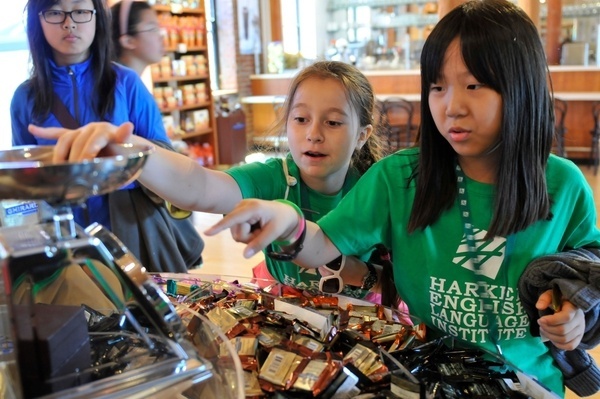 But long before Harker launched the successful ELI program, the school had already earned a worldwide reputation for being among the finest in the United States, which further explains why ELI annually attracts students from diverse Asian and European countries. The ELI program runs for an eight-week intensive session and is always kicked off with a welcome reception for ELI participants and their guardians. Students ages 6-16 are bound for American boarding schools, universities or internationally-based primarily English-speaking schools. They come to Harker to prepare for and increase their chances of admission to their next educational institution. For the younger ELI students, formal class instruction is combined with enrichment programs, such as swimming and playing games. Often ELI students are able to join in activities with children attending the regular on-site summer camp, allowing them to have fun while improving language skills. Karen Glovka, ELI primary program teacher, said the program for younger students teaches English in the context of what children like to do. True beginners, who know no English, learn greetings, colors, shapes, numbers, the alphabet (names of letters and sounds) and school and family vocabulary. Students with more developed skills work on reading, writing and computer skills. “We strive to keep the learning fun,” explained Glovka, who for the past 10 years has also taught Spanish during the regular school year at Harker’s lower school. The most advanced ELI students, usually middle and high school-aged, stay at the Saratoga campus and work on special projects tailored to their needs, including SAT preparation. They are assisted by mentors (called buddies or conversation partners) who are Harker juniors, seniors or recent graduates. These older ELI students receive visits from admissions directors from some of the finest boarding schools worldwide, who come to Harker personally to meet with them and give presentations about what their schools have to offer. Joe Rosenthal, Harker’s executive director of advancement and the former director of Harker’s elementary boarding program, is also a frequent guest lecturer to the ELI program on the topic of studying in the United States. This past spring Rosenthal organized a series of receptions in Asia on behalf of ELI, which provided a chance for the school to reconnect with several alumni now residing there. At the end of their time at Harker, ELI students, upon full completion of either a three- or seven-week course, are eligible to receive a certificate (handed out during an official closing ceremony) and recommendation from their teachers. On field trip days ELI students of all ages can be seen sporting green program T-shirts as they head out for cultural adventures to such diverse attractions as the Golden Gate Bridge, the Exploratorium, Academy of Sciences, Monterey Bay Aquarium, Santa Cruz Natural Bridges State Park and the Tech Museum. Some ELI participants and their guardians opt to live with friends and relatives in the area. Others choose to stay at The Marriott Residence Inn, which made housing available for ELI students this year. ELI participants at both the lower and upper schools may come with the primary goal of being able to travel, speak and learn in the States, yet they often leave with something they might not have anticipated: wonderful memories and strong ties to their new Harker community!